It’s holiday season, therefore the perfect time for entertaining…I love that part of the year, have friends over, celebrating and making special treats for anyone who comes visit. Holidays does not necessarily means heavy and rich food, and over indulging oneself either. Since I am quite focus on nutrition and strongly believe that fitness is the second most important thing after a healthy diet, I am always looking for creating delicious and light appetizers than one can nibble with a glass of Champagne, without feeling guilty about ruining your workout or gaining weight. I discovered sweet potatoes when I came to the US. In France or Italy we use, mainly regular potatoes. I have been trying to substitute regular potatoes with sweet potatoes in some dishes and sometimes, the result is quite satisfying. Those canapés are very tasty, the sweetness of the potato, is like a match in heaven with the spicy mint/cilantro/garlic sauce topping the shrimps. This is my own version of the Chimichurri sauce from Argentina. If you have any leftovers, you can serve it with almost anything, grilled fish, grilled steak, I like to top it on a slice of grilled bread, and so on. Peel the potato and slice in about 1 cm thick slices, drizzle with olive oil, salt and pepper and place in the oven for broiling. Do not place too close from broiler or the potatoes will burn and not cook. Broil for about 15-20 minutes, until the potatoes and slightly grilled but tender from the inside. Sauté the shrimps in olive oil for a few minutes, add salt and pepper and set aside. For the sauce, place all the ingredients, in a mixer, and blend to a medium-fine consistency. You still need to see the fine pieces of the herbs. This entry was posted by silvia on December 20, 2008 at 2:22 pm, and is filed under Appetizers, Fish/Seafood. Follow any responses to this post through RSS 2.0.You can leave a response or trackback from your own site. Sweet potatoes instead of crackers or bread. Very smart and nutritious idea! I love your use of sweet potatoes! What a great idea. I’d imagine the sweetness of the potatoes compliments the chimichurri beautifully. Congratulations on having this be on the Top 9 on FoodBuzz! It’s a gorgeous recipe and I love the notion of using sweet potatoes instead of bread. We’re always looking for alternatives, and sweet potatoes are such a wonderfully flavored ingredient. The chimichurri comes at a great time, since so many people are gathering their last harvest of herbs from the garden — I know we are! 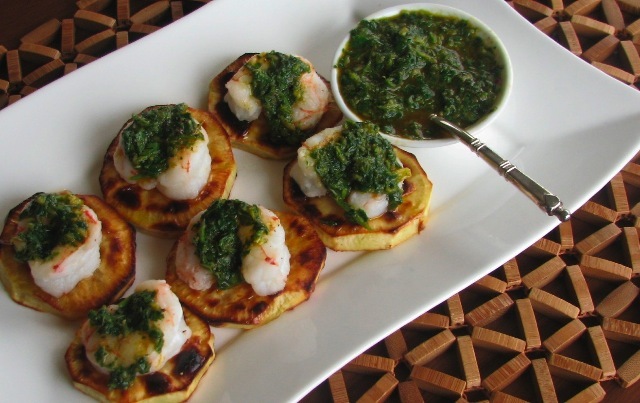 I am crazy about chimichurri, and this looks like a perfect way to use it. Yum. Yum, that looks soooo good! Looks very good, I love sweet potatoes! I am having a dinner party soon and I will definitely try this one. Looks great! Yum, those look great – so creative! We will be doing a cocktail function for the Argentinian Embassy here in Manila and I was asked to prepare some Argentinian canapes. This shrimp dish is a winner! Ity will definitely be a part of the menu! Thank you very much for making life easy by sharing your recipes! This shrimp dish is a winner! I will definitely include it in the menu! Thank you very much for making life easy by sharing your recipes!